So I'm not one that normally drops alot of money on designer brands and I tend to buy what I think is cute and wear what I feel is comfortable not paying attention to brands. 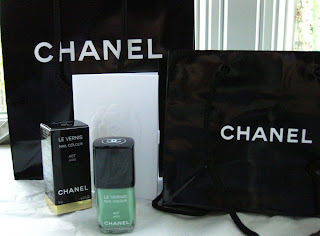 With that said, I have never owned anything Chanel...till now. I've worked very hard and decided I needed a treat, so I skipped off to the local Chanel store in DC to buy the nail polish that I have been craving (but haven't been able to find a similar color of yet)! Much to my dismay- they had sold out of their 100 bottles in over two days! 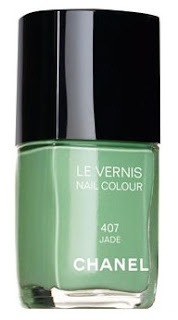 Yes, I'm talking about the Le Vernis Fall 09/Winter 10 Jade nail colour! Much thanks to Esther she scoured the stores all over the US to find me a bottle and had it sent to my house. When I got home yesterday a box awaited my arrival. I was like a little kid on Christmas morning (only I footed the bill) when I opened it up. I haven't been this excited in a long time. I was even excited over the tissue paper it came wrapped in. I think if it were big enough I would have wrapped myself in it! I love this polish! I ran right upstairs and painted my nails! 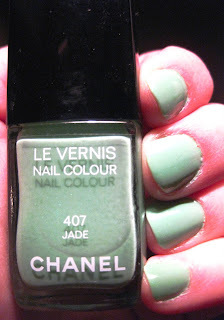 I think if I could permanently have this polish tattooed on my nails I would. Now I painted it on thick- I wanted to soak in all the green the little bottle could give me. The color is very pastel and happy like summer, but yet it has a chilly ice feel to it as well that makes it perfect for fall and winter. I tried to show that it isn't just a flat colour but has lots of iridescent sparks, so stunning! 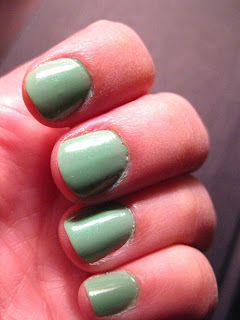 Sorry I was venting- so tell me: What do you think of this yummy nail colour? Can you recommend any brands that do a green that is similar? Oh and don't forget to enter my Giveaway!! I love that polish so much!!! you should check OPI or just try going to a nailpolish store anywhere... they have tons, but never like chanel! its amazzziiing. 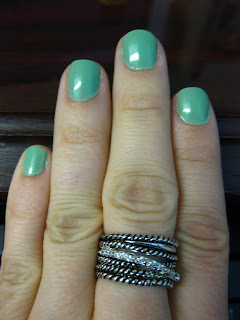 i have a similar colour, the mint green by Barry M! It is such a great look, and all my friends in NYC are wearing it for the fall/winter! Gorgeous colour love! Lusty lusty! omg i am SO jeal you got this color! i think i have my name on the waiting list in like every chanel store but they are ALL sold out! i went on ebay and the bottles were selling for look 100 a piece! wowzers! who is ester? i need her lol great blog btw!